Poor air quality is the largest environmental risk to public health in the UK, associated with short and longer term respiratory and cardiovascular problems. Approximately 40,000 premature deaths in England, or 300 in Bristol, can be attributed to NO2 and fine particulate matter pollution every year . Additionally, the most vulnerable members of society are often hit more by pollution creating and worsening health inequalities. Legally, concentrations of nitrogen dioxide (NO2) must not be more than 40 μg/m3 (microgrammes per metre cubed) as an annual mean (i.e. measured over a year). Yet across the UK there are many places that exceed these limits, including in Bristol. How much of the problem is caused by non-residents driving into the city? This will be established in the detailed modelling work we will do during 2018. What is Nitrogen Dioxide (NO2)? This is an excerpt from the Health Matters report by Public Health England. NO2 is a gas that is produced along with nitric oxide (NO) by combustion processes. Together they are often referred to as oxides of nitrogen (NOx). The Department for Environment, Food & Rural Affairs (Defra) estimates that 80% of NOx emissions in areas where the UK is exceeding NO2 limits are due to transport, with the largest source being emissions from diesel cars and vans. Other sources include power generation, industrial processes, and domestic heating. The Committee on the Medical Effects of Air Pollutants (COMEAP) has established that short-term exposure to NO2, particularly at high concentrations, is a respiratory irritant that can cause inflammation of the airways leading to – for example – cough, production of mucus and shortness of breath. Studies have shown associations of NO2 in outdoor air with reduced lung development, and respiratory infections in early childhood and effects on lung function in adulthood. Epidemiological studies have also shown associations of outdoor NO2 with adverse effects on health, including reduced life expectancy. It has been unclear whether these effects are caused by NO2 itself, or by other pollutants emitted at the same time by sources such as road traffic. What are the key phases of the project? There are three key phases of the Plan. Phase one developed and analysed a wide range of possible options to improve air quality in the shortest possible time. A long list of options was reviewed and screened to get to a short list of packages. We have published our shortlist of packages as part of the Strategic Outline Case (SOC) on our website. In Phase two (April 2018 – 2019), we will carry out a technical assessment of the short-listed packages, assessing them against a range of outcomes (impact on air quality, health, traffic, equality, etc). We will also carry out extensive engagement work to get the views of residents, commuters, and other stakeholders on our packages, to make sure we’ve not missed anything important. This will enable us to select a preferred package of measures and determine how that package will be implemented, which will be presented in the Outline Business Case (OBC). We will also bid to government for both implementation and mitigation funding at this stage. Phase three (2019) will involve fine-tuning of the preferred package of measures. We will engage with you to decide on the final details of design and implementation of the preferred package. This will allow us to put forward a final bid to the Government, in our Full Business Case (FBC), for funding to deliver the preferred package in 2019 – 2020. What kind of options are you considering? Defra’s Clean Air Zone Framework states that local authorities should consider charging measures and non-charging Measures in their Clean Air Plan -. An example of a charging measure is a Clean Air Zone (see next section), while non-charging measures can be measures that encourage a shift to greener modes of transport or that mitigate the impacts of a charging measure. We have considered a long list of options across these two categories, before combining them into packages of complementary measures. How have the options been assessed? The measures on the long list have been assessed against a set of criteria provided by the government’s Joint Air Quality Unit (JAQU). These criteria are based on the HM Treasury Green Book. Firstly, measures unlikely to achieve NO2 compliance within the timeframe were removed from the long list. Remaining measures were then assessed against a multitude of criteria, including: public health impacts; social impacts; economic impacts and scheme cost. A copy of the scoring table for each measure against the assessment criteria is available as part of the Strategic Outline Business Case. What would happen if we did nothing about air quality? We have assessed a baseline option, which considers the scenario where there is no action taken by BCC on air quality. All options or measures are then considered against this baseline case. Under this baseline case, compliance with legal limits is not expected to be reached across Bristol until 2025. This would mean BCC and the UK Government would be in breach of the legal limits for another 7 years, during which time the negative impacts on public health would not reduce sufficiently. How can I input into the decision-making process? Despite the short time frame, we want to ensure you have plenty of opportunity to ask questions and offer your views. Along with a formal consultation period later in the year, we’ll continually talk to as many people as possible from April 2018, starting with a series of drop-in sessions, workshops and other events. We’ll also build on the regular contact we’ve had with interested parties over the past months. This dedicated web page, a regular newsletter and social media activity will also keep you informed. Throughout, we’ll liaise with neighbouring local authorities and the West of England Combined Authority (WECA), recognising that solutions will undoubtedly involve our partners. Come talk to us at one of our events. A Clean Air Zone is a new mechanism proposed by the government to help cities tackle air pollution. It is a defined geographical area which requires polluting vehicle owners to pay a charge on entry to or movement within it. The charge is based on vehicle Euro standards. The aim is to accelerate the improvement in emissions of the vehicle fleet. Charges would not affect every vehicle, just those that do not comply with levels set by government (see questions 2 & 3 for further information). Further information on the levels set by government can be found in the Clean Air Zone Framework, which sets out principles that should be followed when setting up a CAZ in England. A CAZ is being considered in Bristol as part of a package of measures aiming to reduce air pollution to legal limits in the shortest time possible. A decision has not been made to charge vehicles driving in Bristol. The feasibility study for Bristol’s Clean Air Plan recommends several options that can help improve air quality in Bristol to meet legal limits. Some of these options involve Clean Air Zones of varying geographies and classes. These options will be developed further over the rest of 2018, with plenty of opportunities for the public and stakeholders to provide input. The government guidance for the study requires that we use a CAZ as a benchmark option. Are there different types or classes of CAZ? The Government guidance requires the CAZ classes above to be assessed in that order of preference (class A, then class B, etc). This means that a higher class of CAZ can only be considered if the lower class will not improve air quality in Bristol enough to meet legal requirements. Whichever class is chosen, Euro 4 petrol (approx. 2006) vehicles or a Euro 6 diesel (approx. 2015) vehicles would not be charged, nor would electric or hydrogen powered vehicles. Further information can be found in the Clean Air Zone Framework, which sets out principles that should be followed when setting up a CAZ in England. What is a Euro Standard? European ‘Euro’ emission standards aim to reduce levels of harmful exhaust emissions, by defining acceptable exhaust emission limits which become more stringent over time. Euro standards were first introduced in 1992 with Euro 1, when catalytic converters became compulsory on new cars. Euro 6 is the most recent standard. Where can I find out what Euro Standard my vehicle is? Unfortunately, there is no centralised official website and this is new territory for both local authorities and the government. We have asked government to provide this and this will be in place by December 2018. Transport for London‘s online tool allows people to find out if their vehicle will be charged in the Ultra-Low Emission Zone:. This is not a definitive source of information. How much of the city will be included in a clean air zone? A large zone – this was roughly the Bristol urban area within the boundary of the M4 and M5 and excluding areas within Bath and North East Somerset (BANES) and North Somerset. A medium zone, roughly the Air Quality Management Area. 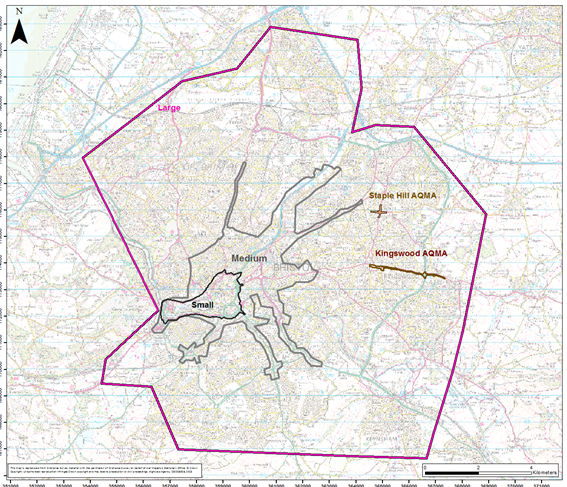 Two other variations of the medium zone were considered, to include two smaller Air Quality Management Areas in South Gloucestershire Council (but within the city of Bristol). A small zone, within the inner ring road. These boundaries are shown in the map, below left. The feasibility study indicated that a large Clean Air Zone would not achieve compliance with legal air quality requirements quickly enough because implementation time is very long. Therefore it will not be considered further. As part of the initial work to assess responses to a CAZ, the medium boundary was revised as shown below (right). This is an indicative boundary to support modelling and will be subject to further consultation. Many factors will be considered before the final boundary is determined. These will develop as the Plan progresses and we welcome your thoughts. Why can’t Bristol go further? The Council has a number of powers, but we are nevertheless constrained in a number of ways, requiring the co-operation of transport operators and the general public and more funding for improved infrastructure. Air quality is a national problem and therefore needs a coordinated approach to ensure standards in different cities are consistent and fair while cutting harmful emissions as much as possible. We are ready to introduce changes which will make a positive difference to this significant public health problem in our city. The funding available is for measures that deliver air quality improvements in the shortest time possible, and mitigation for those adversely affected by measures to deliver compliance. This is the main reason why measures that take a long time to implement (such as a large Clean Air Zone, and large infrastructure schemes of the scale of Metrobus) are not being considered further as part of this Plan. When will a Clean Air Zone begin? There is too much uncertainty to give a date for when a Clean Air Zone be implemented, should that be the outcome of the technical work being undertaken 2018-19. The timescale will be dependent on the scheme selected and the many factors influencing difficulty of implementation. We believe that the soonest any of the UK city can achieve implementation of a CAZ will be 2021. Bristol started after the first wave of cities so it is likely to be after that. Bristol will aim to achieve compliance in the shortest time possible. How long will the CAZ last? How will a Clean Air Zone be enforced? A CAZ would be enforced using Automatic Number Plate Recognition (ANPR) cameras placed at entry/exit points and within the CAZ. These cameras will capture vehicle movement on the monitored road(s) enabling chargeable vehicles to be determined. The exact locations and number of ANPR cameras will be determined as the Plan progresses, with plenty of opportunity for the public and stakeholders to have their say. The council already uses ANPR to enforce traffic regulations. The project will assess what new cameras and infrastructure are needed to enforce a CAZ, if it is needed. Why isn’t the council setting up a Low Emission Zone (LEZ) instead? Clean Air Zones are similar to but not the same as Low Emission Zones. Clean Air Zones are intended to incorporate more than just restrictions to the most polluting vehicles. They will include other measures designed to complement a CAZ and, where possible, to mitigate some of the negative impacts. To ensure that we are consistent with other cities in the UK, we must use the Government’s Clean Air Zone Framework rather than a city-specific LEZ. This consistency helps businesses to better adapt to the changes and avoids confusion for those travelling between different cities. Some cities have chosen not to have a CAZ – why? Each city has locally unique information about their air quality problems and likely future scenarios. Although air quality is a problem in many UK cities the degree of the exceedances (of legal limits), and the significance of certain sources varies greatly. Any action must be proportionate to the severity of the air quality problem. Hence, a CAZ may be required in one city but not another. What is the difference between a CAZ and a congestion charge? How will the council determine the level of the charge (price)? The level of charge is dependent on a number of factors. The charge would need to be at the right level to discourage enough polluting journeys to achieve compliance through switching to a greener vehicle or using public transport, cycling or walking. However, the charge also needs to be set in consideration of local conditions, expected social and economic impacts and comparisons to other areas. We are using stated preference surveys to provide further local insight into an appropriate charge level. This will be complemented by guidance from JAQU on levels of charges. We will engage with the public and stakeholders to assess the impact of such a charge. Will the CAZ operate 24/7? This is yet to be determined and will be assessed over the coming months, with inputs from technical traffic modelling work and our engagement work. What happens if your vehicle is already within the zone and then you drive in the zone on another day? It is likely that a CAZ will involve charging vehicles on a day-by-day basis. This means if you drive within the zone in any new 24 hr period you will be charged. There would not be a charge if a vehicle is parked within the zone and does not move. This will be discussed further during our public and stakeholder engagement work. How do vehicles pay the charge? This is still to be determined. It is expected that there will be an online system, with the Government intending to produce a national, centralised system to process charges so that the overhead costs for all the local authorities required to implement a Clean Air Zone are minimised. More details to follow. What difference will a CAZ make to traffic levels? The aim of the CAZ is to reduce NO2 concentrations within the city rather than reduce traffic levels. However, the CAZ may alter traffic from the present levels in the short term, as people adjust their travel choices. The difference in traffic would depend on what type of CAZ is implemented i.e. there is likely to be more of an impact on traffic if all vehicles including cars (Class D) were charged compared to a Class A being charged. Potentially, there will be a reduction in traffic on the roads within and approaching the CAZ as not everyone will have a compliant vehicle and/or be willing to pay the charge. However, any congestion improvements are likely to be short term only. As vehicles are replaced with cleaner models and can drive within the zone without charge, traffic levels are likely to return to current levels or change in line with predictions. What benefits would a CAZ bring beyond improved health and air quality? Health and air quality improvements are the key aims of a CAZ. However, there is potential for a CAZ to bring secondary benefits. If a class D CAZ was introduced, a possible short-term benefit could be a reduction in the number of journeys made by private vehicles, which could reduce traffic levels, improve bus patronage and result in faster and more reliable journey times. If fewer people are developing health problems than before then this could provide economic savings to the NHS and economic benefits from reduced absenteeism. It is also possible that some measures included as part of a CAZ will create better conditions / infrastructure / facilities for cyclists and pedestrians in Bristol, leading to public health benefits arising from increased active travel. A Clean Air Zone could also improve the attractiveness of Bristol in the long term, as a healthier place to live, work and visit. How can we be sure that a Clean Air Zone won’t just push the traffic and the air quality problem elsewhere? This is a risk, but we are aiming to achieve compliance with legal requirements across Bristol. As such, a CAZ would be designed to prevent the shifting of the air quality problem to other areas and significant modelling is being done to assess the risk of traffic displacement. Will a CAZ lead to local “rat running”? We have considered this when defining the boundaries of the CAZ and all efforts have been made to avoid this situation from arising. As part of the scheme assessments, traffic modelling was carried out to test the implications of each type and size of CAZ on traffic flows and routes. More detailed modelling will take place within the Outline Business Case which will be worked up over the next few months. As part of the engagement process we will be listening to the suggestions from the public and areas of particular concern can be discussed at events or raised through our social media channels or via email. Will there be discounts for local residents? We do not know at this stage whether a discount for residents will be included in the final package of measures. Legally, any exemptions or discounts cannot affect the timescale in terms of securing compliance. However, exemptions and discounts will be considered as part of our assessment and informed by our public engagement work. To ensure we capture your views we will be holding a number of drop in events, workshops, surgeries and a formal consultation period in 2018. This will provide you with the opportunity to comment as the project progresses and enable us to incorporate your feedback into the Clean Air Plan development. A range of non-charging measures are being considered in order to mitigate the impacts of the CAZ, including the financial costs to residents living within the zone. The mitigation measures chosen will depend on the size and type of CAZ selected and the number of residents impacted. Government has provided a mitigation fund of £220m (the Clean Air Fund) to help local authorities and Bristol will bid for this funding in autumn 2018. We welcome your ideas to help us form the bid to government. Will there be discounts for vulnerable groups (including elderly, disabled, low income households)? We are aiming to ensure the final preferred package of measures does not disproportionately impact vulnerable groups of society. At this stage of the project, we are considering various mitigation measures. Exemptions and discounts will be considered as part of our assessment and informed by our public engagement work. To ensure we capture the views of these groups we will be holding a number of drop in events, workshops, surgeries and a formal consultation period in 2018. This will provide opportunities to comment as the project progresses and enable us to incorporate your feedback into the plan development. How will you capture the views of businesses? Implementing a CAZ could have negative as well as positive impacts for businesses and some businesses may be impacted more than others due to their specific business model and operational requirements. This will be given appropriate consideration as the package of measures is created. To ensure we capture your views we will be holding a number of drop in events, workshops, surgeries and a formal consultation period throughout the year. This will provide you with the opportunity to comment as the project progresses and enable us to incorporate your feedback into the Clean Air Plan development. How might the CAZ affect the competitiveness of Bristol compared to other destinations? Bristol would not be the only UK City to adopt a CAZ. 61 local authorities have been directed to reduce air pollution in the shortest time possible. For example, Bath is also considering introduction of a CAZ. We hope and expect that a cleaner, greener city will improve both residents’ and visitors’ experience of the city. What happens to the money from charges in a CAZ? The purpose of a CAZ is not to generate revenue but to improve the health of local residents by discouraging polluting journeys. We want to deter polluting journeys rather than raise money from them. The money collected from a CAZ would go to central Government. The costs of running the central system would then be removed and what is left will be circulated to local authorities to cover the local operational costs of running the scheme. If there is any surplus revenue arising from the scheme, the revenue can only legally be re-invested to deliver improvements in local transport. So if there is any surplus money from the scheme it would be reinvested in the scheme itself and in sustainable travel options. What is the government doing to force car companies to pay for this? We recognise that emissions from diesel cars are the dominant source of NOx, and that under the “Polluter Pays” principle car manufacturers need to take responsibility for the problem, but securing funds from the industry is outside the control of local authorities. We, along with other local authorities, are discussing how to address this concern with national government. I bought diesel because UK government said they were better for the environment! Now I’m told they’re bad for air quality. What should I do? To meet climate change targets, the Government encouraged the uptake of diesel vehicles based on their lower CO2 emissions. However, NOx emissions from diesel vehicles vary so widely from their type approvals that air quality in cities across Europe has not improved as predicted. The best solution would be for a greater share of journeys done by foot, by bike, or on ultra-low emissions vehicles, but we recognise that this is not possible for all. Encouraging greener modes of transportation including electric vehicles or travel using public transport are options we are exploring as part of the Clean Air Plan package of measures. It’s unfair that diesel purchasers should be penalised as they bought in good faith. Will there be a scrappage scheme? The government issued a consultation in the autumn of 2017 to gather views on measures to support motorists, residents and businesses. This included a targeted scrappage scheme for car and van drivers in specific areas across the UK. In the government’s response to the Clean Air Fund consultation it indicated that a national scrappage scheme would not be taken forward. However, other mitigation measures to help diesel car owners could be available if a Class D CAZ is implemented. Why should cars be charged when lorries and buses are the problem? Cars would only be charged with buses and lorries in a Class D CAZ. The contribution of lorries and buses to NO2 emissions varies between monitoring sites in Bristol. Overall, diesel cars cause 40% of the air pollution from transport in Bristol, while diesel buses and coaches cause 23% and diesel vans causing 22%. The Government’s Clean Air Zone Framework advises us to consider emissions from buses and HGVs ahead of car emissions, but they are not the sole, or even major source of the problem. The overall aim of Bristol’s Clean Air Plan is to bring about compliance with EU limit values in the shortest possible time. We are therefore considering a range of measures focused on a variety of transport modes. Current evidence shows that the performance of EURO VI buses and HGV’s is much closer to their type approval ratings than cars. What are you doing to support businesses which will be affected by potential air quality measures? We recognise a lot of small businesses in particular will have difficulty converting or replacing small vans or HGVs. Many of these businesses will be based outside Bristol but need to travel into Bristol. We will be engaging with Bristol’s business community throughout the Clean Air Plan’s development to assess the impact of any potential charging zone. We will also continue to liaise with the government, applying for grant funding when it is available, to ensure we can support businesses transition to using low-emission vehicles. It’s important to consider the impacts of a charging scheme an all sectors of society, and the study will report on this, but we do have to take action to secure improvements in public health which may mean restricting movements of polluting vehicles. How have the CAZ boundaries been set? We are considering a CAZ as part of our Clean Air Plan, though a decision to have a CAZ has not yet been made. The size of a potential CAZ has not yet been confirmed. We are currently testing two possible boundaries – a “Medium” and a “Small” – please see the map showing the indicative boundaries which will be used in the modelling. The modelling will determine the optimum size needed to achieve compliance with air quality standards in the shortest time possible. It is important to note that just because an area is not included within the CAZ boundary, it does not mean that air quality is of a lower priority here, or that the air is currently clean in that area. Although the CAZ is geographically defined, a CAZ will have the effect of cleaning up the vehicle fleet across the whole city and region because polluting vehicles will be charged to drive in those areas where there is the most demand to travel (the central area) and hence people will change their vehicle sooner than they otherwise would, or use a cleaner mode (if we decide to charge cars). The CAZ will also deter “through” trips for polluting vehicles, again improving air quality on the arterial routes that pass through areas that are not within the bounds of the CAZ. We are also assessing, through traffic modelling, the impact of displacement, i.e. the extent to which drivers will try to avoid the zone by driving round it – and possibly increasing pollution in the non CAZ areas that border the CAZ. The medium zone reduces displacement in comparison with the small because it is further to drive to avoid the zone. The boundaries of the CAZ are determined by assessing its desired effect on driver behaviour rather than purely ambient air quality levels. In summary, just because the CAZ boundary does not include an area, it does not follow that the area will not benefit from the CAZ. We intend to ensure that everywhere within the city complies with the EU standards for pollution in the shortest time possible. Can businesses claim tax back on any CAZ charges? The approach to give tax relief for qualifying business journeys in Clean Air Zones should be covered by the current rules for travel and expenses. There is one exception – there would be no tax liability where an employer reimburses an employee for the charge using their own vehicle on a business journey. HMRC advise there is a lot of detail in the underlying travel rules so there is some more nuance but the position is basically as set out above. These are a series of measures that will be implemented alongside a Clean Air Zone in order to further reduce NO2 emissions or mitigate the CAZ impacts. They include: encouraging active travel modes such as cycling, changes to parking systems, encouraging the use of public transport, and investment incentive measures. We will be consulting on these measures as part of our engagement work and we look forward to receiving your suggestions. Why can’t we just have non-charging measures? The effectiveness of using non-charging measures alone to lower NO2 to legal limits was assessed as part of our technical work. Bristol City Council has achieved some success in reducing car trips over recent years, by promoting use of sustainable travel. Since the Air Quality Action Plan was published in 2004, there has been a sharp increase in cycling and use of public transport in Bristol. However, despite this improvement, demand for travel by car has risen due to population growth and rising economic activity in Bristol. Non-charging measures have not been sufficient to achieve compliance to date. If we take the example of Metrobus, previous modelling estimated that this very large scheme will lead to a drop of NO2 concentrations by a maximum of 5% at some locations. This is equivalent to approximately 4µg/m3 at Rupert Street. However, at this location a drop of 20-30µg/m3 is required to achieve compliance with legal limits. Additionally, a scheme of the scale of Metrobus has taken 6 years to deliver, from initial planning to completion. This would be too long for meeting the government’s requirement to achieve compliance in the shortest time possible. To test the impact of using only non-charging measures in Bristol, an ambitious target was assumed for the Clean Air Plan; that a reduction of 5% in traffic levels could be achieved within 2 years. This assessment found that with this level of traffic reduction, the year we expect to achieve compliance would not change from the baseline case (or ‘do nothing’ case) year of 2025. Sufficient non-charging measures are unlikely to be deliverable in the short term or be quicker to deliver than a charging scheme. The Council has been directed to achieve compliance in the shortest possible time, and therefore non-charging measures will be used to complement a CAZ and where possible designed to mitigate impacts. What non – charging measures are being considered? The Clean Air Plan considers a number of non-charging measures, summarised in the list below, a full list can be found in the SOC. If I am charged to drive my car into the centre of Bristol, what alternatives would be provided? The Clean Air Plan considers a range of measures that make it easier for residents and visitors in Bristol to make their journeys on cleaner, more sustainable modes of transport. These are detailed within the Strategic Outline Business Case, and summarised below. The final package of measures will not be decided until December 2018 and we will be consulting and engaging with as many people as possible as the package is developed. We would like to hear from you about how a Clean Air Zone would affect your journeys, what alternatives you currently have, as well as where you would like to see improvements. Such feedback will help us develop solutions that are fair and robust. Do each of the packages consider the same non-charging measures? No, inclusion of non-charging measures varies across the packages considered. Further detail can be found in the the SOC. I’ve thought of a non-charging measure that’s not been considered. How can I share it? We will hold a series of events such as drop-in sessions, workshops and others as part of our engagement programme We would encourage you to attend and discuss your ideas with our project team at one of these events. Alternatively, if you’d like to find out more about the project or have ideas that you’d like to share with us, please get in touch with us, either via email, our website, or social media. Would planting more trees help? This is a common suggestion, and the answer is complicated. Evidence from research is mixed. However, even if trees did make a difference the effect would be very small in comparison to the size of the problem and would not deliver compliance in the shortest possible time. Trees of course offer multiple other benefits in urban environments. Two recent (July 2018) reports from ONS (Office of National Statistics) and AQEG (Air Quality Expert Group) have looked at this issue. ONS – UK air pollution removal: how much pollution does vegetation remove in your area? Isn’t air pollution made worse by bus lanes? Bus lanes enable a better bus service for the general public by encouraging a shift in travel option from private vehicles. Work done by BCC in assessing the effect on pollution of the introduction of a showcase route on Fishponds Road showed a small overall improvement in air quality after the introduction of the scheme. Can’t the council just improve bus services? Bus services in Bristol are operated by a number of companies. Whilst the Council subsidises a small number of services, the vast majority are commercial services. BCC can influence the operation of these services through a number of mechanisms (e.g. traffic regulation conditions, bus partnerships) but the level of control is limited. MetroBus, a rapid public transport system that will provide an express service to key destinations in the area using a combination of segregated busways and lanes, will use low emission vehicles. Working with the bus companies to reduce the pollution from older buses has led to a retrofit project to reduce emissions from 35 of the most polluting buses from a grant awarded in 2015 and recently Bristol won £2.2m for cleaning up a further 81 buses operating in Bristol and South Gloucestershire..
As part of the Clean Air Plan, we are looking at several non-charging measures that help improve bus services and encourage a shift towards cleaner buses. We will work closely with bus operators, users and other stakeholders to develop and refine these measures as the Plan progresses. Why do Defra’s predictions differ from local ones? Defra predictions are based on outputs from their Pollution Climate Mapping (PCM) model which is used to report legal compliance to the EU. The model is calibrated against measured concentrations from the national monitoring network (Defra’s Automatic Urban and Rural Network – AURN), but does not take into consideration all data available from Local Authority monitoring networks. The verification process for the model is therefore reliant on fewer monitoring locations than local models, which can result in over or under estimations in the PCM model. Defra estimates this overarching uncertainty to be in region of +/-29% (Defra AQ Plan – Technical Report, pg 16). This varies by city. Only one monitoring station in Bristol is used for verification of the PCM modelling. Conversely, local predictions use data from 4 automatic monitoring stations and 105 NO2 diffusion tube monitoring sites across Bristol. The difference between the number of monitoring stations used by each model is the driving factor for the difference in air quality predictions. Defra acknowledge that BCC data more accurately reflects the local circumstances, and this data will be used to determine the most appropriate course of action. What air quality monitoring does Bristol City Council do? Air quality monitoring in Bristol is comprehensive and long-standing. Bristol’s monitoring network is focused on NO2 as the concentrations of this pollutant near busy roads exceed the health‐based national objectives and European Limit Values. The current air quality situation in Bristol is shown in this map, which shows measurements of NO2 from diffusion tubes at locations across the Bristol urban area. BCC monitors NOx and NO2 using a combination of automatic “reference method” instruments and non – automatic (passive diffusion tube) monitoring. In addition to the sites listed above operated by BCC, Defra operate two automatic sites measuring NOx and PM in St. Pauls and on Temple Way. Wouldn’t more monitoring help provide a clearer picture of the problem? More monitoring is always beneficial and the existing monitoring network was expanded at the start of 2018 to support monitoring and evaluation of the Clean Air Plan. However, we already have a good picture of the existing air quality problem in Bristol from the extensive monitoring network in the city, which includes real-time monitoring and diffusion tubes. The evidence we have already makes it quite clear that action is needed to tackle poor air quality. Details of the existing data are provided in the Air Quality Annual Status Report which can be found here. Citizen sensing, where citizens use low-cost monitors to take their own measurements of air quality, can often be to raise awareness about air pollution, but the data gathered cannot be used by BCC because the quality of the data is not high enough. Have different monitoring methods been considered? We have followed the Defra Local Air Quality Management Guidance (also referred to as LAQM TG16) when considering which monitoring methods to use. In Bristol, the majority of monitoring that has been carried out to date focuses on NO2 and particulate matter. continuous monitoring stations – these record data in real-time, but are expensive to install and maintain. diffusion tubes – these are cost-effective monitors that provide a wider coverage of NO2 concentrations but need to be replaced every month and that provide a better spatial coverage of NO2 concentrations. Both monitoring methods are accepted by LAQM TG16. The standard of instruments that can be used by local authorities is prescribed in LAQM TG16, and due to the difficulty of measuring concentrations of nitrogen dioxide in the parts per billion range, low cost sensors are not appropriate to use for this pollutant. Particulate matter can be monitored using a large number of different technologies, but mainly by continuous monitors. Although newer, low-cost sensors have appeared in the market in recent years, they have not all received approval from Defra and large uncertainties remain over their performance. Is it possible to have access to the data used in this project? Where possible we will share the data once it has been approved and verified. How does WECA fit into all of this? Air pollution isn’t just a problem in Bristol, but also in other parts of the region (such as Bath and parts of South Gloucestershire). Addressing air quality problems across the West of England requires coordinated action at a regional level, since the impact of any measure will likely be felt by road users across the region. We are working closely with the West of England Combined Authority (WECA) to ensure that emerging policy reflects the magnitude of the air quality problem and the urgent need to address it. This way, we can ensure the measures being considered can be integrated with, and support, the longer-term spatial planning and transport strategies for the area. This includes the Joint Spatial Plan, Joint Local Transport Plan and Energy Strategy. What is the interaction between this project and the Joint Transport Study? We are producing a Joint Transport Study (JTS) with the wider West of England local authorities as part of an ambitious programme of transport and planning policy reform. At this stage, WECA is considering the contents of JTS in order to produce a future vision and a final Joint Local Transport Plan for the West of England. We are working with WECA in the development of these plans, to ensure they are consistent with the progress of this Clean Air Plan. If the need for a Clean Air Zone is based on EU limits, does Brexit change things? The Air Quality Directive, which sets out the EU limits, has been transposed by UK law with the same limit values applying. The Government is committed to making the air cleaner regardless of the outcome of Brexit. How will scrapping tolls on the Severn Bridge affect air quality? We will carefully monitor air quality levels once the charges are removed during 2018 and in advance we will incorporate consideration of these changes in our technical work on the Clean Air Plan. What does the National Institute for Health and Care Excellence (NICE) say about CAZs? Clean Air Zones are one of the measures recommended by the National Institute for Health and Care Excellence, and considered to be cost effective in improving health. NICE guidance also says we should consider a wide range of measures to reduce air pollution, not just charging vehicles. NICE cites encouraging walking and cycling, driving training to reduce emissions, actions to smooth traffic flow, and prompting the uptake of low and zero emission vehicles. How do the fines the government face compare with the cost of funding the scheme? The aim of our project is to reduce air pollution to legal limits in the shortest time possible. The main reason for this is improving public health – cost is not considered unless there are two schemes that are equally effective and quick. With regards to fines from the European Union, we do not know this information – please redirect your queries to JAQU. What about the work being done as part of the Bristol Air Quality Action Plan? This will continue because it addresses longer term issues and other pollutants than just NO2. The Air Quality Action Plan will be updated in 2019. What is causing the air quality problem? There are two forms of air pollution we are concerned about and which we measure. The first is particulate matter (PM), referred to as PM10 and PM2.5, depending on the size of particles being measured. The second is nitrogen dioxide (NO2). Concentrations of both vary across the city and according to the season, the weather and the time of day (mostly due to changing traffic volumes). PM and NO2 is monitored in Bristol at various locations across the city. The PM levels at our monitoring sites have been below the EU and UK limits for several years. However, the levels of NO2 currently exceed EU and UK limits. The results from our monitoring work consistently show much higher levels of NO2 near busy roadsides, and lower levels away from roadsides and traffic, indicating a direct link between vehicle movements and air quality. Like NO2 pollution, we know PM pollution is linked to poor health. By tackling NO2 pollution, we will also help lower PM levels. How much of an improvement is needed in Bristol to meet legal requirements? Our predictions show that by 2021, there would still be 8 NO2 monitoring sites in Bristol that remain in breach of EU and UK limits if we don’t take action now. These predictions are based on NO2 concentrations averaged over a year (“annual mean”), and projected forward based on Defra’s future projections. They predict that without further action, Bristol would not meet legal limits until 2025. Currently, some sites in Bristol experience NO2 levels of 90µg/m3, which is more than double the EU maximum limit of 40µg/m3. This is to do with the alert levels set in the government’s Air Quality Index. They relate to short term (daily) predictions and measurements of air quality. These are important for people with respiratory health problems but not strongly related to the long – term health effects on the population from poor air quality that are represented by the annual mean measurements. So pollution levels in Bristol as measured by the air quality index can be low throughout the year, but we still breach the annual mean objective for nitrogen dioxide. Recent concentrations of nitrogen dioxide are shown in the map below. Dots displayed in yellow or red indicate that the air quality objective is being breached at these locations. To understand the air quality problem in Bristol, we have collected data from an extensive monitoring network in the city. Bristol City Council monitors NO2 using a combination of automatic and non‐automatic (passive diffusion tube) monitoring. In Bristol’s recent Annual Status Report for 2017, NO2 concentrations are shown to still be at a similar level to those measured in 2000. Trends in NO2 concentrations have shown some slight improvement over the last 5 years. At some locations in Bristol city centre, annual mean concentrations exceed 60 ug/m3 and widespread locations of exceedance of the annual mean objective for NO2 exist. The city centre NO2 measurements all exceed the Air Quality Objective. Many other parts of Bristol, especially near busy roads and in the city centre, exceed national objectives and European limit values for NO2. For more detailed information on air quality monitoring, please read the Annual Status Report (ASR) published by Bristol City Council. For current air quality information visit our Open Data Portal. What about pollution from Short Term Operating Reserve (STOR) Plants? The UK Government has introduced new controls on medium combustion plant, which includes the category of generators known as Short Term Operating Reserve (STOR). The Medium Combustion Plant Directive has been transposed into UK law as the Environmental Permitting (England and Wales) (Amendment) Regulations 2018 and requires operators to submit to a permitting regime which introduces effective controls on emissions from these plants. This means that there will be stricter (non – planning) controls on diesel generators in future and they are unlikely to be permitted in cities without effective exhaust abatement. Have you looked at other sources of pollution? We are focusing on measures which will reduce the most harmful pollution affecting our communities but we will look at all options and investigate the most effective ways to reduce levels. There are many sources of air pollution in Bristol, such as industrial sites, gas boilers and domestic wood burning stoves. However, the aim of the Plan is to reduce NO2 pollution within Bristol in the shortest amount of time since this is the pollutant that exceeds legal limits in Bristol. The dominant source of NO2 where people are exposed to pollution is road vehicles. Therefore, the focus of the current work will be on reducing emissions from vehicles, in order to achieve the aim of the Plan and improve air quality within the city in the shortest time. Other sources of pollution have been considered but are small contributors compared to vehicles. What about pollutants other than Nitrogen Dioxide? Bristol only exceeds the legal compliance levels for NO2 and the government directive to the Council is focused on NO2 only. Therefore, measures proposed by the Plan will be designed specifically to tackle NO2. Some measures to reduce NO2 may also impact on levels of other pollutants, and any changes to particulate matter (PM) or CO2 concentrations due to this project will be identified within the technical assessment. Actions to reduce PM concentrations will be set out in the council’s Air Quality Action Plan (a separate document to the Clean Air plan).